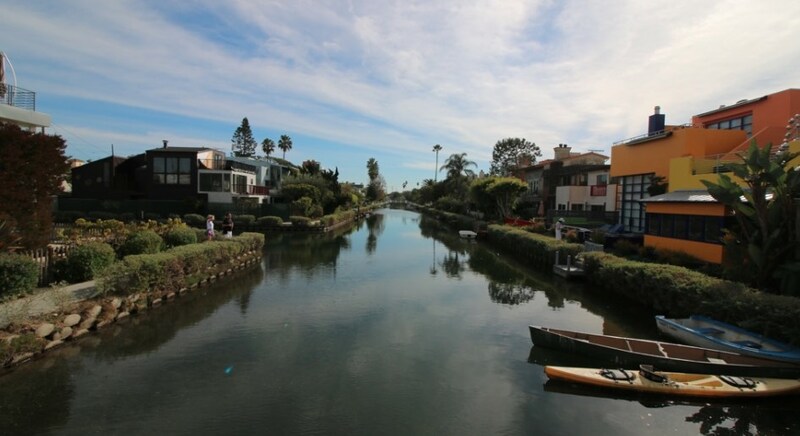 The Venice Canals. Photo Credit: Brian Champlin / We Like L.A.
You know what’s handy? Waking up in the morning, firing up your phone/computer and being able to scan a super quick (but curated) rundown of the best of what lies ahead. So here it is, our list of fun things to do in Los Angeles for today, Monday, January 28, 2019. 1. [11:30 a.m.] Head to Burton Chace Park for a donation based morning yoga session under the pergolas by the marina. Your own mat is required. 2. [6 p.m.] Players Wanted: Alice in Wonderland – A Themed Game Night at Scum and Villainy Cantina. 4. [7:30 p.m.] Astronomy on Tap hosted by Caltech Astronomy happens once a month at Der Wolf in Pasadena. Professionals will give informal talks about a variety of topics while enjoying German beers with the public. 5. [7:30 p.m.] Monday Night Fiction Workshop at Beyond Baroque in Venice. 7. [8 p.m.] The Moth GrandSLAM – LOST AND FOUND The Regent Theater. 8. [8 p.m.] Comedy Night at Three Weavers in Inglewood. 9. [8 p.m.] Hollywood Dodgeball Open Gym Night hosted by World Dodgeball Association. Free for newbies! 10. [various] The 18th Annual 50 Hour Drive-by Theatre Festival is a three day fest (January 26-28) of new plays performed at LA’s most interesting NOHO theatre, Zombie Joe’s Underground.